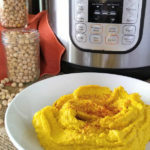 Learn how you can use your Instant Pot to make hummus. Add your dried chickpeas, water, and salt to your Instant Pot. Lock on the lid. Set to sealing. Push the pressure cook button and set the timer to 45 minutes. Allow for the Instant Pot to natural release pressure before opening. Drain the chickpeas. Follow your favorite hummus recipe. You can either process them in a food processor or you can put them back in the Instant Pot and use a stick blender to smooth them out. Then add the rest of your ingredients.